When my beautiful son Gabe was diagnosed with Duchenne Muscular Dystrophy a year and a half ago, my sister gave me a beautiful necklace with the word “HOPE” on it to encourage me. On that day and for a long time after, I did not have hope. I felt like the future for my son had been laid out in front of me. Everything that I had planned for our family and for Gabe was over. It’s a feeling I cannot describe. As time went on, I came to realize that I had a choice to make. I could take the path of despair or I could take the path of HOPE. While I will always have the visions of what life would have been like without DMD in our family, I cannot stop thinking about the possibilities of a treatment/cure and the positive impact that this disease will have on my family as well! We are getting stronger and are so blessed to have Gabe. I tell him all the time, you are my “angel from heaven,” “my hero,” and “my best friend”, and he’ll say, “but Mom I just want to be a kid, I don’t want to be a hero today!” I don’t blame him….that’s a lot to carry on your shoulders!! I know God has so many plans for Gabe….I just know it!! Scott and I look at the word HOPE differently now. It used to be about things so far in the future….now it’s about having a great day NOW!!! Along our journey, we have also come to realize that everyone has their own struggles. There will always be someone in a worse situation than you. You could stand in a line of people with problems or challenges, and there would always be somebody behind you that is struggling more. I try to remember not to compare myself to someone else (although it can be hard), because I do not know their journey. Be kind to everyone everyday! This is my first fundraising idea…although it’s something small, it’s something very dear to my heart. 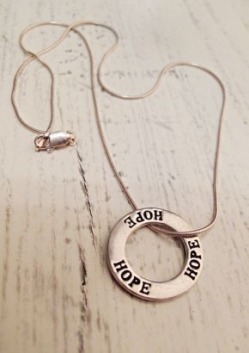 We are selling my HOPE necklaces to anyone who needs inspiration, comfort, or HOPE right now in their lives. It could be someone suffering from cancer, going through a divorce, challenges with a special needs child, unemployment, or just trying to find their purpose in life. We all know someone who is struggling…it may be us. I hope that this necklace might give them the encouragement they need to keep going or just bring a smile to their face. It’s not always easy to find the right words to say to someone in their time of need. Every time I put my necklace on, I think about what HOPE means to me. I will fight this fight because I have HOPE. They are .925 sterling silver, come in 16”, 18”, or 20” lengths. To order multiple necklaces, click the add to cart button below and then change the quantity in your cart to reflect your order. Grab one of these very popular red H4G T-Shirts as these are the shirts that were inspired by the Spain Park High School Baseball Team wearing RED tape (symbol of Gabe’s red hair) during their playoff games in honor of our son Gabe! We had 100 of these at the fundraiser they put on for Gabe and we sold out in 40 minutes! Thank goodness we had a sign up sheet. We were told the next few days after the event, all the kids were wearing them to raise awareness! You go SpainPark!!! To order multiple shirts, click the add to cart button below and then change the quantity in your cart to reflect your order. 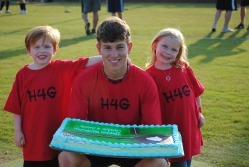 A special thanks goes out to Will Griffin, Matthew Bass, and The Auburn Baseball Team! Will had these awesome red bands made (similar to the Live Strong bands) to symbolize the red tape the Spain Park High School wore in honor of Gabe. Matthew contacted Auburn University and asked if the baseball team would wear Gabe’s Red Bands of Hope during the SEC tournament game vs. Ole Miss...they said they would be honored to wear them! The bands have taken off like wildfire so get yours today! To order multiple bands, click the add to cart button below and then change the quantity in your cart to reflect your order. Remember, to order multiple bands, click the add to cart button below and then change the quantity in your cart to reflect your order.